I don't know what they put in the water in the Scandinavian countries, but the musicians in that region seem to have a way with classic progressive rock. 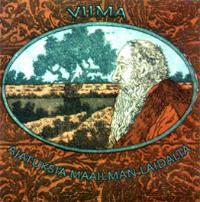 In the case of Viima we get that sound with lots of Renaissance thrown into the mix. Mind you part of that comes from the female vocals, but the organic textures of the music don't hurt either. You also will probably hear a whole host of other classic prog bands in this outfit's music including Yes, King Crimson, Genesis and ELP. All that said, though, the particular combination of sounds and the way the group uses these inspirations is fairly unique, but will certainly please fans of 1970's prog rock. While there are no real epics (in terms of length) only one track falls under the six-minute mark, and even then it's only by a couple seconds. The longest number, the disc's powerful closer, clocks in at around nine and a half minutes. It should be noted that the all the lyrics here are in Finnish (their native language), so I have no idea what they are singing about. The thing is, this music is so strong that I didn't really care. Similarly it didn't bother me that I couldn't sing along. Fans of classic progressive rock, you may have just found a new band upon which you can latch your musical passions. I have to say, whatever it is about Scandinavia that causes this type of stuff, let's hope it's contagious. 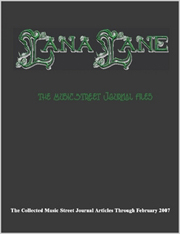 This review is available in book format (hardcover and paperback) in Music Street Journal: 2006 Volume 3 at lulu.com/strangesound. The sounds of a gentle storm begin this, then a sedate and pretty keyboard texture enters to carry it forward. As the vocals enter the track takes on a musical structure that calls to mind Renaissance. While the vocals here are also female, they don't sound at all like Annie Haslam. They have a bit less airy nature and are a little more rock and roll. Of course the Finnish lyrics would take that element off the table, too. They move this prog rocker through several changes and power it up a bit. Varying instruments get solo segments. Then it moves into a powerful and lushly arranged instrumental segment that calls to mind vintage Genesis quite a lot. A very tasty guitar solo comes in during this portion of the track. After this extended instrumental passage they take it to a fairly brief vocal segment and then a powerful outro. This one comes in more rock and roll, but still with classic prog textures all over it. They drop it back to a prog rock ballad approach to carry it forward. There are still Renaissance elements on this one as it builds gradually. In fact, here the vocals are probably much closer to Halsam's. Eventually this moves out into a related instrumental passage, then crescendos and gives way to a new mellower, but exceptionally dramatic and beautiful progression. After this holds the track for a short time a guitar riff brings in more hard-edged sounds that combine elements of classic hard rock with more traditional progressive rock textures. This keeps getting reworked into new musical themes in very effective ways. A cool keyboard solo comes over the top later for good measure. A false ending gives way to a harpsichord segment that builds into a full on keyboard solo with definite renaissance, the period not the band, leanings. This eventually shifts out into a rather noisy, Phantom of the Opera like organ solo that serves to end the number. The keyboard textures that serve as the introduction here remind me a lot of Starcastle. The song drops from there, though into a very pretty and potent ballad mode that has elements of early King Crimson (their ballads) and more of the Renaissance textures. This builds quite gradually in very organic ways. Sounds of wind come over the top later in the track. At about two and a half minutes in this takes a major left turn into a smoking hard rocking jam that has both King Crimson like angular changes and a pretty standard hard rock sound to the guitars. A soaring keyboard solo comes over the top of this jam after a while. This whole thing eventually dissolves into a chaotic crescendo, then is replaced by the pretty ballad that came before. It feels all the more sedate after such a furious interlude. This serves after a time as the outro. Ocean sounds, joined shortly by keyboards, serve as the introduction here. As the acoustic guitar and vocals join we find another ballad approach, this one a bit more tentative and sparsely arranged. After a verse it moves out into a more rocking motif that is based in some of the most Renaissance-like sounds of the disc. After another verse keyboards take the cut for a time, then another Genesis-like guitar solo segment becomes the order of the day for a while. As the keys come over again, this is still in a mode that calls to mind Genesis, but when the vocals return this style merges with that Renaissance format to carry it. A slightly off-kilter rhythmic pattern dominates the Genesis-inspired instrumental section that takes it next. This jam after a time also takes on other prog textures like ELP and others in a killer progression. The keys really steal the show on this segment. As they peak out in triumphant tones it drops back to the Renaissance main song structure to carry onward. The earlier instrumental segment - with the keyboard dominance takes it next. Then this falls back to a new jam with flute running as the lead instrument. There are some mild Jethro Tull leanings here, mostly from that flute, but this also has a definite fusion texture, primarily due to the rhythm structure. The guitar manages to put in another very meaty showing in an evocative solo later. Then the keys regain control. Another verse comes over the top of this energetic mode and with the vocals comes more Renaissance sounds. A couple more quick changes emerge before the music ends and leaves just the ocean sounds to take it out. Keys and acoustic guitar present the ballad-like motif that serves as the first segment of this cut. This type of sound carries it for the first minute and a half. Then it moves out into an instrumental progression that has both a slightly harder rocking texture and a somewhat oddly timed rhythm. As saxophone solos over the top I hear King Crimson again. This doesn't last extremely long, though, instead dropping back once more to the ballad styles. As this one kicks out again to instrumental wanderings King Crimson is all over this incredibly tasty morsel. The sax really puts in a remarkable performance this time out, but once again they drop it after a time to the ballad motif. They power this out a bit later in a rather organic combination of these two sounds for the outro. Percussion starts this one and then it becomes a rather unique sounding prog rock jam for a short period. As it moves forward, though, more rather Genesis-like elements, merged with the Renaissance textures that often dominate Viima's style, take it. This moves into a short instrumental turn before moving into the song proper. The vocals on this one are the most effective of any on the disc, and again bring in more Renaissance comparisons. This is one instance where I really wish I could tell what was being sung. Later a keyboard dominated break takes it temporarily. A very tasty instrumental segment later starts as sort of a over-powered version of the earlier themes, but then moves out into something much more dramatic. This section has elements of Haslam's group, but also some Yes and ELP. Then it drops back to a pretty keyboard solo that is much more sedate. This eventually moves the track back out in dramatic fashion to the ballad stylings. In what is becoming a pattern a new instrumental break (this time with screaming guitar solo) takes the cut after the vocals again end. This one gets very involved and powerful. After a time it moves out to an intricate, more sedate pattern that finally ends it and the album in very satisfying fashion.